Ryan Hinds, a former CFL defensive back, always knew he wanted to pursue a career in health care. The trick was finding the right role to tackle. Now a community engagement lead at the Toronto Central Local Health Integration Network (LHIN), Hinds said, growing up, most of his knowledge about the health-care field centered on traditional roles like doctors or nurses. “I initially only looked at health care from a provider perspective without considering how social determinants of health impact the lives of youth and people in general,” he said. After graduating with a pre-medical degree in biology, Hinds seized an opportunity to play football professionally, winning a Grey Cup title with the Edmonton Eskimos – a far cry from his original plans to be a doctor. But upon his retirement from football in 2016, Hinds decided to pursue a Master of Health Science in Health Administration degree at U of T's Institute of Health Policy, Management and Evaluation (IHPME) at the Dalla Lana School of Public Health. For Hinds, the MHSc program opened his eyes to the many careers available within the public health system, including the opportunity to lead change and work with the community. “The program taught the crucial skills one needs to become a leader and an agent of change, and the network I built with classmates and faculty was invaluable,” said Hinds. Now Hinds is hoping to help young people, especially those from under-represented communities, learn more about different career opportunities available within public health systems. Along with Dalla Lana’s Director of Advancement Annette Paul, and Dean Adalsteinn Brown, Hinds is co-leading an outreach and access program for youth, with the first pilot rolling out at Marc Garneau Collegiate Institute, a Toronto high school. 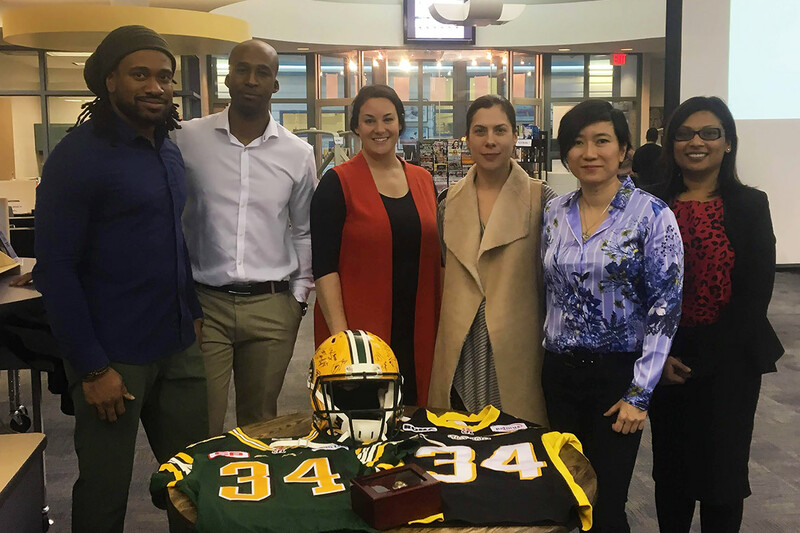 Recently, Hinds joined Paul, Emily Seto, an assistant professor at IHPME, and Charlotte Lombardo, a lecturer at Dalla Lana, at the high school, where they introduced the pilot program to over 140 students in the Thorncliffe Park neighbourhood. Students had the opportunity to ask questions about concepts like artificial intelligence development in health care, and learn from Hinds about his experiences as a new immigrant to Canada. By helping to create an educational pathway for youth, the hope is they will be inspired to consider the various disciplines in public health available to study, including health informatics, and social and behavioural health sciences. “Out of this first pilot I really want to see that students find this valuable,” said Hinds. Hinds has a wealth of experience in engaging the community and providing mentorship. While playing football, he channeled his desire to make an impact in the lives of others into helping teammate Jonathan Hood develop and expand a mentorship program for youth that focused on leadership through sport. The Ahead of the Game Youth Mentorship Program collaborates with schools across Ontario to help sidelined students achieve more. Tailored to the climate within a school, the program seeks to touch upon a variety of issues, from communication and teamwork, to understanding yourself as an individual, your image, and career planning. “Some youth lack an adult role model in their lives that they can have an honest conversation with,” said Hinds. Now a U of T alumnus, Hinds has found a career that allows him to focus on the social aspects of health care, having been inspired by the success of his role with Ahead of the Game. As the lead for community engagement at the Toronto Central LHIN, Hinds is intent on understanding what the public needs from its health care. He plans and executes strategies that encourage patient perspectives when changes are made. “It’s a hefty task to design a system for a population as diverse as Toronto, but that’s why it is important to push for community engagement. I wouldn’t want something created for me without being asked how I want it to function or being included as part of its design,” said Hinds. Through Dalla Lana’s new outreach and access program, Hinds is hopeful youth will become more familiar with these kinds of career opportunities in public health, and that the program will continue to interrupt a cycle that includes fewer educational opportunities, lower paying jobs and the inability to move from a certain neighbourhood – all of which have impacts on health.